If you plan on visiting Plano for a few weeks, whether you’re on vacation, interviewing for jobs, or visiting family, it can be hard to find a good place to stay. Some hotels might not have rooms for the duration of your stay while others can be far too expensive. Air B&B is a service that allows you to stay at someone’s home by reserving it through an app on your smartphone. While it may sound like a good idea, there are quite a few reasons why you might not want to use this service. 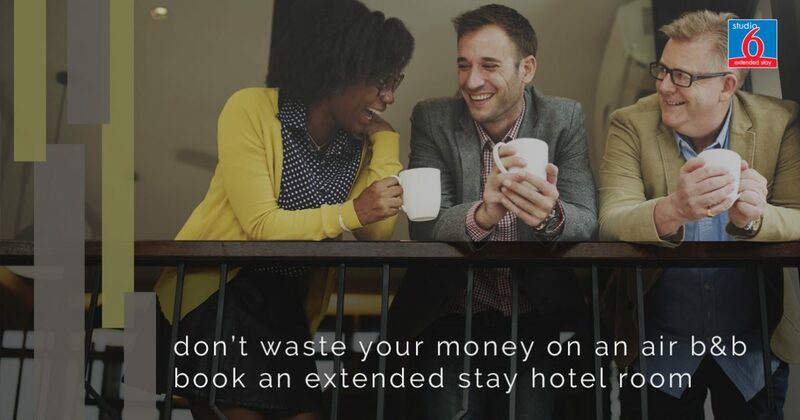 Instead of using a service like Air B&B, stay at Studio 6 extended-stay hotel in Plano while you’re here. Our rooms offer all of the conveniences and comfort of staying in an apartment without all of the hassles that come with trying to secure space on one of those crowded apps. Read on to find out why staying with us is a better idea. While the pictures of a home or apartment that is available for rent on an app like Air B&B might look great, the reality doesn’t always line up. Sometimes the very clean pictures don’t represent the reality of the situation. Unlike an extended-stay hotel, the people who rent out their places on these apps don’t have a dedicated cleaning staff who knows how to make the room habitable between guests. At Studio 6, our staff cleans each room to very strict standards in order to promote health and make you feel comfortable and happy. When we wash the bedding, it goes through a process that ensures cleanliness and softness so you’ll sleep soundly each and every night. One of the problems with Air B&B and other services like it is that they very rarely offer you the ability to stay for long stretches of time. Because an Air B&B is someone’s home, they tend to come back after a few days. If you don’t want to have to keep shuffling your things from one place to another, stay with Studio 6. We have enough rooms to ensure that you can stay with us for as long as you need to. While the idea of staying in a home instead of a hotel may seem novel and exciting, the reality is quite different. Because it isn’t your home, things feel different and you might find yourself on edge, afraid that you may break something that isn’t yours or uncomfortable with the idea that you’re in the home of a stranger. When you stay with us, you can feel comfortable using the space as if it were your very own. We have large rooms that feature a kitchen, so you can bring your own food and your own dishes as well as being able to relax in a space that is yours. Hang up your clothes the way you want, organize the kitchen and bathroom so it feels like your home, make the space yours. Perhaps best of all, at Studio 6, we let you bring your pets with you. Not only does traveling with your pets allow you to save money on expensive kennelling fees, you’ll also enjoy the company of your fuzzy buddies when you come back to your room after applying for jobs or spending time with your friends or family members. If you’ve been searching for a way to spend a good chunk of time in Plano without having to resort to Air B&B, give us a call at Studio 6. We have all of the amenities you need in order to be comfortable and we’re conveniently located very close to many restaurants and shops as well as three different universities.